Adherence to anti-retroviral treatment (ART) has been a significant step towards improving quality of life among people living with HIV. However, stigma has been described to influence adherence to ART. 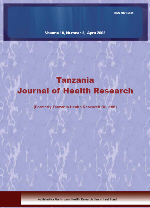 A cross-sectional mixed methods study was conducted to explore factors related to stigma and perceived influence of stigma on adherence to treatment amongst ART-prescribed patients and health care providers, respectively in Tanzania. Stigma was assessed through interviewer administered survey among 295 patients. The results from patients showed that 279/295 (95%) were satisfied with the services provided at the Care and Treatment Centres (CTCs). The set up of CTCs 107/295 (36%), and queuing at the CTCs 88/295 (30%) were associated with stigma (P<0.001). The perceived influence of stigma on adherence to ART was assessed using focus group discussions (FGDs) of 33 health care providers (HCPs). Through FGDs, HCPs perceived the set up of CTCs as friendly yet violated confidentiality. The HCPs reported that ART-prescribed patients hide identifiable cards to avoid being recognised by other people. Some patients were reported to rush to avoid familiar faces, and due to the rush they picked wrong medicines. Also some patients were reported to throw away manufacturers’ box with dosage instructions written on the box, resulting in use of doses contrary to the prescriptions. We conclude that despite the fact that most patients were satisfied with the services provided at the CTCs, it is important that HCPs provide dosage instructions on another piece of paper or use disposable bags. A common dispensing window for all patients regardless of the diagnosis may be useful to minimize stigma. Also HCPs may introduce appointment system to avoid long queue at the CTCs.